As 2007 fizzles out, here’s my complete reading list for the year. I don’t think it’s a bad list, although it could have been a touch longer (especially non fiction!) Links to reviews are in brackets. Here’s to happy reading for all in 2008. My copy of The God Delusion by Richard Dawkins boasts the subtitle “the alternative Christmas gift”. Borders took the joke one stage further by sticking a card inside the cover which reads “oh come all ye unfaithful”. I’m sure Mr Dawkins won’t mind the joke. Reading him, it’s obvious he does have a sense of humour, although my approach to the book isn’t really to seek an alternative Christmas gift or message, or to declare myself unfaithful or not. I like a well written, intelligent book and I like a good argument. Richard Dawkins provides all of this for me. What surprised me is that The God Delusion isn’t just the anti-God polemic that I’d been suspecting, the book that its critics have been ranting about. Dawkins prints some of the abusive letters he has received since its publication, damning him in no uncertain terms, and letters no doubt from people who haven’t bothered to read The God Delusion. The same mentality that led people to burn copies of The Satanic Verses. Dawkins certainly knows his theology, I would say more so than many of his critics, but his well considered book touches on science in discussing how the universe came to be, Darwinism in how we came to be, gene theory in how we came to be like we are and meme theory in how we came to think and act like we do. Yes, you meme-loving bloggers out there, Richard Dawkins is the one who originally coined the phrase meme in 1976. So at times, and what I found very rewarding, is that The God Delusion serves as a kind of Richard Dawkins Greatest Hits, covering many of the topics he has written about at length in his other books. But be warned. Although he does cover themes such as natural selection (one of his favourites), he expects you to have some prior grasp of them. This book isn’t another A Short History of Nearly Everything by Bill Bryson (although that’s a book that serves its purpose well), and if it was it would be four times as large. This is a writer who respects the intelligence of his reader, and Dawkins supplies a rich resource of references to follow if you should see fit, from texts similar to his own (there are several books specifically about meme theory) and links to websites. He even quotes a comment to a blog post that he’s found insightful. The God Delusion isn’t a book that will change my life because I don’t need to be converted to Dawkins’ argument, but it isn’t a book that will only succeed in preaching to the converted either; it is a clever, extremely well researched book that should be read by any intelligent person. And anyone who condemns it unfairly without a good counter argument deserves to be labelled ignorant. And ignorance is one of the things that really annoys Richard Dawkins. Ha! That disgusted you a little, didn’t it? I caught that little flicker of revulsion on your face. Now you’re trying to cover it up, but you don’t fool me with that oh-so-confident look, as though you knew every secret under Heaven. In the 1990s, Clive Barker’s Hellraiser films became something of an obsession with me and the guy I shared a flat with at the time. The first 1987 film is one of my horror favourites, and I’ve recently read with some interest that Barker is currently working on a remake, no doubt utilising the developments in CGI to make his creations more horrific, although the most chilling aspect of the films was Doug Bradley’s performance as Pinhead. More disturbing, the actor is now currently reduced to advertising something on the back of buses in my home town, his huge head often ahead of me in the traffic. But sadly minus the pins. So although he’s always sat somewhere in the back of my mind, it’s taken me ten years to start showing an interest in anything new by Barker. His latest novel, Mister B. Gone, follows the exploits of a particularly loathsome demon in 15th Century England, a backdrop that reminded me at times of Ken Russell’s film The Devils. Human depravity, torture and execution, the actions of mortal man put anything demonic firmly into context. The novel is narrated by Jakabok Botch, mysteriously imprisoned in the pages of the book that he constantly demands that the reader burn. But of course the reader reads on. Barker’s premise is preposterous, but it is a tribute to his skill as a writer that he manages to just about pull it off. His prose is mostly excellent and so is his skill as a narrator, so no matter how incredible the story becomes Jakabok, rather than enticing you to burn the book, entices you to read on. But be warned; Mister B. Gone does contain some sickening passages of pure unadulterated horror. Although anyone familiar with Barker’s books or films will not be surprised. Or disappointed. 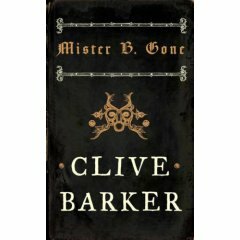 Clive Barker has many similarities with Neil Gaiman in how he uses the foundation that the supernatural world exists in tandem with our own; this is a fact that the reader must accept before they can appreciate how both writers can make the two worlds coexist. You just have to adjust to this seamless integration to appreciate both of these authors. Where Gaiman plunders fairytales and familiar sounding ghost stories to rework in his original style, and often bring them into the modern world, Barker uses the recognisable presence of Hell and The Devil and turns it loose on early society, one that firmly believed in the presence of the demonic, to work his wonders. It’s a conceit that works far better than I would have predicted, with Barker creating a compelling narrator who uses the age old trick of suddenly reminding the reader that they are enjoying something quite horrifying. The novel is peppered with many nudges to the reader similar in flavour to my opening quote. I was glad when I finished Mister B. Gone, but I didn’t want to burn it. But I also don’t think Clive Barker is really my cup of tea any more; perhaps I won’t find Hellraiser films entertaining any more either… he does what he does very well – but ultimately you have to decide whether or not you need or will appreciate fully what he provides. And so begins The Outsider by Albert Camus. Meursault is a young man who is distanced from life; he has a girlfriend, Marie, and a career but remains uncommitted to either. When offered a promotion in Paris he frustrates his boss by failing to react enthusiastically. Similarly, he shows no positive reaction to Marie’s plans to get married and appears to simply drift through his life. It’s far from unpleasant, but he rarely shows that he enjoys it, and his lack of direction or commitment begins to show some worrying signs when he befriends a man called Raymond who rents an adjacent apartment. Raymond is a unsalubrious character who beats women and is pursued by shadowy criminals. He draws Meursault into his confidence who, showing his usual non-committance, is not particularly concerned where this new friendship will lead or the danger it may lead him into. Spending a weekend together with others, Meursault and Raymond run into the latter’s pursuers who attack him. Later, returning to the scene of the crime alone, Meursault shoots and kills one of them. The Outsider is my first taste of Camus and it reminded me of Kafka, where you sink further into the text without realising it. It’s dense and layered, although at first only seeming the simplest of stories. Throughout the novel, Meursault describes the world around him through physical sensations; the heat on the day of his mother’s funeral; the pleasure from swimming in cool water; food and drink. He is baffled by the night long vigil beside his mother’s coffin; it’s the coffee and cigarettes that keep him awake. When he kills the man it is prompted by the glare of the sun in his eyes – an arguably physical reaction. Imprisoned and facing trial for murder, Meursault continues to show his usual lack of emotion. He describes prison life in great detail, but never complains about it. His only concern is satisfying his physical urges – sexual desire and addiction to tobacco. Marie continues to visit him and the visiting arrangements, with prisoners seperated from their families by huge metal grilles, sounds horrendous – although Meursault makes no complaint once he overcomes the physical barrier of managing to converse over the noise of the other prisoners. He gets used to things, however dismal his life becomes. When the trial commences, the prosecution appear more concerned with his lack of humanity to his late mother. Witnesses are called from her rest home and attendees from her funeral. Meursault’s character is torn apart, his coldness towards and abandonment of his mother more cruel in the eyes of those who judge him. They are less concerned with a cold blooded murder than exposing a cold blooded man. One of the most memorable characters in the book is Salamano, another tenant in the block of apartments where Meursault resides. Salamano takes his dog out every day, cursing and reprimanding the elderly and sick animal. His foul tempered relationship with the dog becomes a source of amusement for Meursault, until the dog runs away and a heartbroken Salamano seeks consolation in him. It’s the only character in the novel who expresses longing and regret for something that’s happened, either from their own actions or those of others. And although Meursault offers him support, he doesn’t really understand, and when facing execution at the end of the novel he finally pours his energy into an outburst against the prison chaplain – a man who suggests he might like to turn towards God for some mutual support. 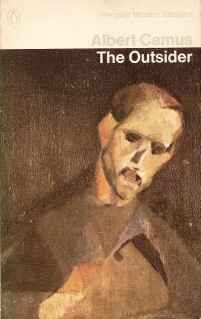 As well as its obvious debt to Kafka, The Outsider reminded me of the type of drama sometimes referred to as the theatre of the absurd; stark, weird but endlessly readable and open to interpretation. The cover above is from the Penguin Modern Classics 1971 edition (the novel was first written in 1942). Jacques Villon’s painting will haunt me as a vision of Meursault; fading, insignificant, condemned. The walls and door of the kitchen are painted that creamy, brownish white that was so popular at the time. It was as if people were afraid to let any real light and brightness into their lives – or it had never occurred to them that they were allowed to do so. Jonathan Coe is an author who just gets better and better. From What a Carve Up!, through to The House of Sleep, The Rotter’s Club and The Closed Circle, I’ve found his fiction always inventive and witty. His latest, The Rain Before It Falls, is his strangest piece to date. Experimental, serious, different, it may prove to be the oddity in Coe’s collected work. Or it may be the beginning of a new, more mature, stage in his writing career. The novel is written from the point of view of Rosamond, whose first person narrative comes in the unusual form of a set of C90 cassettes found after her death. Even more unusual, they comprise of a series of monologues describing a set of twenty photographs to a blind girl. Coe sets himself a tricky challenge, but one that ushers in many opportunities for the ambitious writer. How we rely on photographs to record the truth and how they never really can, the comparison between amateur snapshots of life (the photograph) with art (a portrait painting), the problems with memory and narrative when emotion clouds and gets in the way, the sober realisation that life is never neat and can never be comfortably catalogued and filed away; it’s all here. The premise of The Rain Before It Falls is a difficult one, and a less skilled writer could easily get bogged down with the conceit, but Coe manages to use it only as a framing device. The real strength of the novel is the story, with the descriptions of the photographs serving to add a touch of originality. Rosamond unfolds the history of her childhood friendship with the unruly Beatrix, and her subsequent encounters with her family which lead to the tragic story of Imogen, the blind girl in question. Rosumond is full of regret, and longing, and ultimately her efforts lead nowhere; it’s a sad and moving tale. One of Jonathan Coe’s strength as a novelist is his eye for social history and detail. He doesn’t give the impression that he’s researched anything; he just appears to know his stuff. In one chapter Rosamond describes the interior of a 1950s kitchen. The decor, its limitations, the whole rhyme and reason for it comes alive because Coe just appears to be in touch with this distinct moment in history, a very real and English kitchen; ordinary, drab, but very, very real. He’s also reached the Ian McEwan stage where he can tackle complex ideas quite effortlessly; he makes great writing appear easy. I’m going to be watching his next move very closely.